The Greater Niagara General Hospital Auxiliary is celebrating its 90th anniversary. 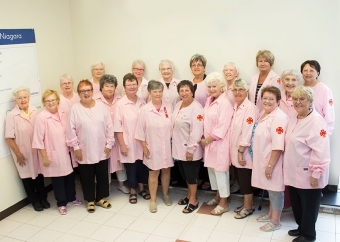 Through its impressive history, the GNG Auxiliary has made many contributions to healthcare in Niagara. The Auxiliary most recently made a $500,000 pledge in support of Niagara Health’s Niagara Falls site, in support of critical patient equipment needs. Notable past donations also include: $500,000 towards a transformational renovation of the Niagara Falls Emergency Department and more than $100,000 each to Surgical Services and Laboratory. Over the last three decades, the GNG Auxiliary has passionately fundraised for Medical Imaging, Breast Screening, Emergency Services, Surgical Services, Laboratory, and the Its Our Time campaign. The Auxiliary is hosting an "Auxiliary Through The Years" display outside their gift shop at GNG Monday, Oct. 2 until Wednesday, Oct. 4, between 10 a.m. and 2 p.m. each day. Learn more about our auxiliaries here.